WHY WOULD Niels Brisbane, a former sous chef at Canlis, Seattle’s grande dame of fine dining, decide to commute 60 miles north to the Skagit Valley? I drove to The Bread Lab/Canlis Research Kitchen in Burlington to sit down with Brisbane, culinary director. Despite its seven ovens, The Bread Lab is a bit chilly and dark on this morning — and surprisingly still. “It’s a pretty big space for a few people,” says Brisbane, referring to the staff of five, plus three graduate students. The quiet is totally different from a busy restaurant kitchen. A Washington native, Brisbane had heard about the groundbreaking work of Stephen Jones at The Washington State University Bread Lab, which started in 2011. Researchers there test 10,000 varieties of wheat, barley, buckwheat and other grains to develop new varieties that taste great, are nutritious and grow well in our climate. It’s a grey Seattle morning, and sheets of rain beat down on a yellow building in the city’s Ravenna neighbourhood. 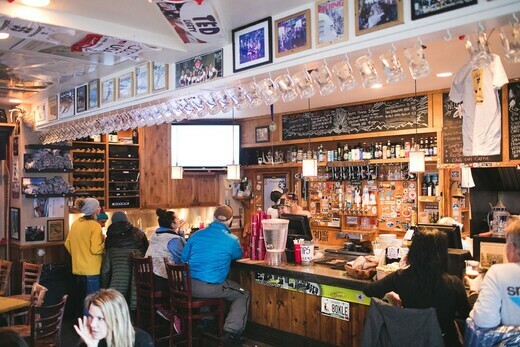 Just a few miles north of the Amazon headquarters, this quiet residential area houses three restaurants owned by acclaimed chef Edouardo Jordan, including Lucinda Grain Bar, which opened last December. I duck in from the rain and enter the tiny space that has just two dozen seats – it feels intimate and familiar, like someone’s home early in the morning. Wainscoting and cabinetry are painted dark blue, and glass bottles and jars line the walls, filled with dried beans and grains. But despite its diminutive size, one can expect great things to happen here, because Jordan runs the show. Jordan, dressed in jeans, clogs and a black JuneBaby sweatshirt, welcomes me with his characteristic broad smile. JuneBaby, his outrageously popular Southern American restaurant next door, earned a prestigious James Beard Award for Best New Restaurant last year, among countless other accolades, making it difficult to score a table. Facing a rain-streaked window, he explains the concept behind Lucinda and how it differs from his other two restaurants – JuneBaby and the Italian-inspired Salare. When the space next door to JuneBaby became available, he leapt at the chance to consolidate the functions of the three eateries. “We also thought, since we use ancient grains at the other restaurants, let’s do more of that,” Jordan reveals. “WOULD YOU LIKE coffee? Water? Are you hungry?” Chef John Sundstrom, wearing a characteristic blue apron, opened the door of his Capitol Hill restaurant, Lark. A warm welcome is typical at Lark, which Sundstrom and his partners Kelly Ronan and J.M. Enos (also his wife) own and operate together. 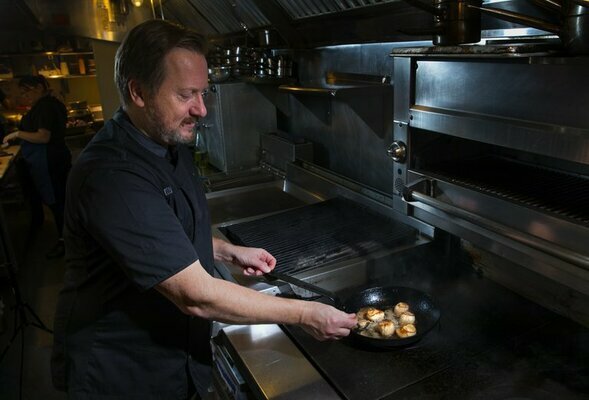 On the restaurant’s 15th anniversary, the chef reflected on his culinary journey and the evolution of Northwest cuisine. Baeckeoffe (baker’s oven) is a traditional stew from the Alsace region. Traditionally made with leftovers or lesser cuts of meats such as pigs’ trotters, the dish today has many variations. Typically, a trio of meats is used: pork, lamb and beef. In Alsace, people would pour a bottle of wine over the meat and let it marinate for a day or two. Then the stew was slow-cooked, often all day, to be enjoyed when the work was done. ARNIE OMLIN, a third-generation Washington farmer, didn’t know much about whiskey until a craft distillery came into his life and saved his family farm. Omlin’s office sits in what used to be the summer kitchen of a 1905 farmhouse in the arid Quincy Valley, an area bordered by the Columbia River to the west and the city of George to the south. His wife, Phyllis, designed a pond that shines in their backyard among rockery, sunflowers, corn fields and an old Chevy truck. When irrigation came to the valley in the 1950s, so too did Omlin’s dad and uncle. Omlin’s parents, Helen and George Omlin, raised corn, beans, wheat and barley — along with nine children. “Farming is in my blood,” Omlin says. After school, he would hand-top beets. Like many small family farms, the Omlins’ operation has faced challenges. Omlin used to grow vegetables for seed — carrots, radishes, turnips — until the consolidation of seed companies made it financially untenable. “I was getting paid less and less each year,” he says. But that year, spring was expected to be cool. “Honeybees will just sit in the hive in cooler weather,” Mr. Freese said. He needed a way to ensure more flowers would develop into fruit than in the past. At a horticulture meeting, he learned that blue orchard bees — a native species that doesn’t make honey or live in hives — could be used to supplement honeybee pollination. Blue orchard bees will fly at cooler temperatures. Mr. Freese bought 12,000 cocoons and set them in his orchard to emerge when the trees bloomed. His investment paid off. “We doubled our cherry production from any previous record year,” he said. THIS SUMMER, Cara Loriz can be found in the fertile fields south of Port Townsend among organic carrot, spinach, pepper and corn plants, with bees and butterflies buzzing in colorful dahlias, poppies and zinnias. As executive director of the nonprofit Organic Seed Alliance, Loriz oversees this bountiful research farm at Finnriver Farm & Cidery, where new vegetable varieties are tested and bred. Organic Seed Alliance, the leading seed institution in the nation, is committed to meeting farmers’ seed needs through research, education and advocacy. Before the industrialization of agriculture, Loriz explains, farmers were more self-sufficient, selecting and saving their best seeds for the following year. While industrialization brought efficiencies in food production, two downsides were a decrease in the diversity of foods and a loss of adaptation to regional climates. Uniformity was king. Today, most seed is supplied by a handful of large corporations, Loriz says, and most of that seed might not do well in organic gardens and farms. OSA works to increase access to organic and savable seed. “It is part of our common cultural heritage,” Loriz says. To put seed back in the hands of farmers, OSA teaches farmers and gardeners across the country how to select and save seed. A free guide can be downloaded on the OSA website.